Dominic his wife Maria, and sister in law Emilia came down from the frigid weather in Ohio for some fun, sun and fishing in the Big O. They all caught fish and they even caught some bigguns! Maria caught this 6 lb 2oz. beauty and Dominic caught this 4 1/2 lb as well. They have now sworn to make this a yearly trip. Thanks for coming and look forward to seeing you next year. Steve Wheeler and his buddy both from Pa. have been looking forward to coming to Okeechobee for 30 years. They finally made and fishing was phenomenal! They caught 42 bass in under 6hrs on 8 dozen wild shiners. These guys have 2 more days with us it sure will be tough to top today! As the weather heats up so will the fishing come on down and enjoy some time on Florida’s largest lake and the U.S’s 2nd largest lake. The fishing is awesome! Art Wittern from Minnesota and his buddy from Iowa came down to escape the frigid weather and catch some Florida bucket lips. 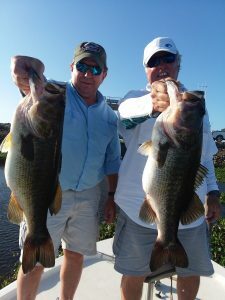 These guys spend a lot of time fishing together but this is the first time they have fished together in Florida. They both caught some really nice fish and a total of about 30 or so total. The fishing will continue to get better as we creep closer to the new and full moons. 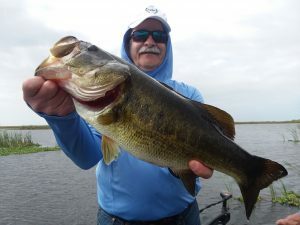 Lake Okeechobee Bass Fishing is really starting to heat up! These fish are moving up daily to spawn this Spring should be amazing! 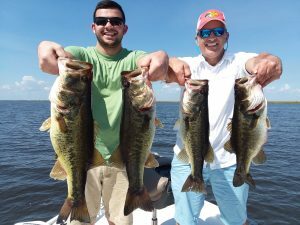 Nick and his son got to spend some time together bonding, fishing, and catching some nice Florida bass. These guys are returning customers and I am sure they will continue to come back year after year since they seem to catch em up each and every time they join us. The blue bird skys didn’t seem to slow the fish down today like usual, just shows you never know how these fish will react to different situations and weather. 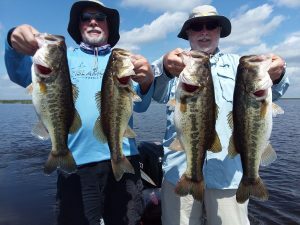 Danny and Delbert were back again to try a new Lake and they wacked em! These guys know how to catch them for sure. We caught about 25 bass and ALL of them were over 4 lbs including these 2 7lb + we caught as well. Delbert lost one at the boat that would have went 9lbs. or better. 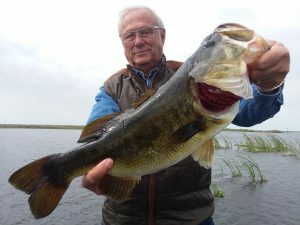 Stick Marsh fishing is a blast and if you would like to fish there we would LOVE to take you. Crappie fishing is on fire there as well we caught 5 crappie over 2lbs. after catching these nice fish. 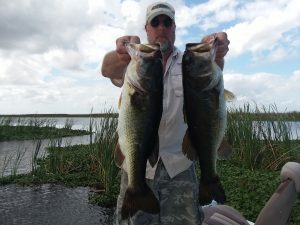 Come one down and enjoy some awesome Florida fishing! 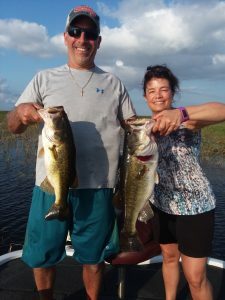 Tim Finafrock came down to enjoy some fun, sun and fishing with Okeechobee Fishing Guides. Boy, did he catch some fish! We caught 35-40 bass in this 8 hr. trip with several being in the 4-5lb range. 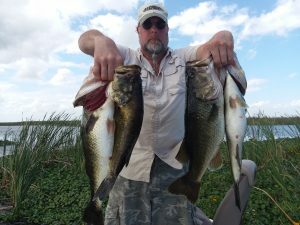 This trip has been on Tim’s bucket list for years so it truly made his year to catch SO many nice Okeechobee Bass. We also saw roseate spoon bills, coots, gators, too many different duck species to count, and many other South Florida species. This has got to be my favorite time of the year!